Data were analyzed on 438 women at the average age of 32, with history of fertility issues due to ovulation problems. This group was studied during an eight-year period. During this time, those who took iron supplements were about 40% more likely to be fertile than the women who did not take iron. Nutrition and diet play a huge role in fertility and reproductive health. This study has shown a 40% increase in fertility by using iron. This study had a 40% rate while including women who did not want to get pregnant. Which type of iron is best? Food-based iron is the best choice because it is highly absorbed and had no side effects like synthetic iron is known for. When synthetic iron is consumed, one may experience constipation. I use Blood Builder from Mega Foods but actually prefer to use the Baby and Me prenatal from Mega Food and get everything I need all at once. What are some foods that contain iron? Can I get too much iron? If you are using supplemental iron you can get too much. A good dosage is around 27mg a day. Final Notes: It is important include this information with a quality, nutrient-dense fertility diet. Make sure to take iron with your vitamin C for best absorption. I like the combination found in Baby and Me. I have had chronically low iron my entire life due to having a blood disorder (vonwillebrands). I was recently told that my iron was less that 17% of what it should be, and I was put on supplements. I was also told that is likely why I had a miscarriage in October, and why we have had no luck with pregnancy previous to that. I started taking Feramax, and increasing iron in my diet. How long does it take for iron levels to rise enough to sustain a healthy pregnancy? There is no one standard length of time. Each person is different! I have been on my fertility journey for about 3.5 years. I have been taking prenatal vitamins all along. I am concerned about the impact of prolonged increased iron intake from these types of vitamins? Can this be an issue? I have not heard of a negative impact from consuming a whole food prenatal multivitamin long term in the absence of pregnancy. While there are signs and symptoms of “iron overload”, it is my understanding that this would be hard to do if taking a multivitamin as suggested and eating a balanced diet. The way to truly learn your own iron levels would be testing with your doctor and if concerned levels may be too high, do reach out to him/her for guidance. is that why Geritol is suppose to work so well for fertility? Geritol is a multivitamin with added iron and the makers do not claim that it increases fertility health. There is no proof that by taking Geritol pregnancy will result. Although if you have low iron levels and poor nutrition, taking any multivitamin may boost overall health and then potentially boost fertility health. We don’t suggest any old multivitamin however. We support taking wholefood multivitamins meaning the nutrients (vitamins, minerals, antioxidants, etc.) come from whole food. Whole foods contain everything for the nutrients to be delivered to the correct place within the body. Natural foods were created in such a genius way, that they not only contain vitamins and minerals but within them are catalysts and enzymes that aid that nutrient to be utilized properly by the body. 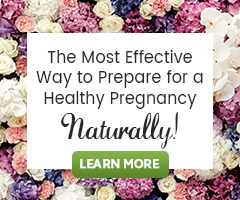 Two wholefood multivitamins for women are Fertile Woman One Daily Whole Food Multivitamin is a woman’s multi intended for use while trying to conceive and Baby and Me Whole Food Prenatal is intended for use when pregnant and while breastfeeding. We wish it were as easy as “a baby in every bottle” ;-), but naturally supporting fertility health is more complex than that. Update 2014 – We are back! We have been away for a while and we sure have missed all of your wonderful questions and thoughts on our articles. Moving forward, one of our staff herbalists will be here to respond to comments! We look forward to connecting with our readers, once again! Hi, I have a family history of haemochromatosis (holding onto iron in the body, which can overload it, unless relieved by blood-letting). Do you know anything about too MUCH iron, and its possible impact on fertility? Thanks! I don’t know that much about it. Thanks for brining it up. Because this condition is typically passed down from parents to their children (genetic), should you go on to have children, your children may be at risk for this same issue. Too much iron in the body may cause many other health issues, which may impact a persons ability to achieve pregnancy. It is best to work with a doctor regarding this type of health issue. A medical doctor will be able to better answer any questions regarding your particular case of haemochromatosis in relation to your overall health and ability to go on to have a child.